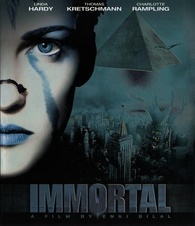 In Immortal, Jill (Linda Hardy) is half human, half alien who is rescued by Elma (Charlotte Rampling; Babylon A.D, Cleanskin). Elma is a scientist who is interested in her for science. Nikopool (Thomas Kretschmann; Blade II, King Kong) is awaken from a cyrogenic sleep. At the same time this happens, there's a flying pyramid in the sky with the Egyptian Gods living in it. At the same time, Horus leaves in order to take human form and takes over Nikopool's body. At the same time, the head of New York is on high alert as he learns that Nikopool has escaped from his sleep and wants him dead. Immortal leaves more to be desired. While the visuals look great; what disappoints me is the fact that most people are CGI whereas there's about five or six people in the film are real. It kept taking me out of the film. Also, the plot was confusing as to why the head of New York wanted Nikopool dead. I was confused on that. Sin City and Casshern did it much better in terms of films that are shot on green screens. I find it funny how they caked on make up on Charlotte Rampling and made her look about twenty to thirty years younger. I think all of the real people who are in this film and not the CGI creations did a great job in this film. I can understand CGI'ing the Egyptian Gods, but, they should have had all of the people and aliens to be either real or CGI and not both. Thomas Kretschmann, Linda Hardy, and Charlotte Rampling did a fantastic job. Kretschmann's rants and struggles against Horus are amusing. And Linda Hardy is very nice to look at. I give this movie a 3/5. Considering the live action footage was all shot on 35mm, is the video quality supposed to be this bad? I think that TF1 did all the mastering in either 720 or 576 and blew it up to 1080 for their HD Master. When the opening screen came on, there's this halo around the borders of the image. Most of the image is decent, but not that strong. Close up shots of faces are detailed, but, not that strong. Transfer wise, this left me for more, shame. 2.5/5. First Look Pictures (Millennium Media) gives us two audio presentations on the disc; English DTS-HD MA 5.1 and English Dolby Digital 2.0 tracks. Why on Earth do studios add multiple audio tracks along with the DTS-HD MA track? However, both sounded good. I give the audio a 5/5. We have a "Special Effects Featurette" that is almost eleven minutes long. Then a "Making Of" that is a half hour long. Some of the "Special Effects Featurette" stuff that is discussed is brought up again in the "Making Of" segment. The back cover states "Immortal Theatrical Trailers", well, there's one. That's singular, not plural. Then we have trailers for; "Sukiyaki Western Django", "War Inc.", "Blood Brothers", and "Cyborg Soldier". Video quality on all of these bonus features is horrible. Especially the trailer for "Sukiyaki Western Django", it looked as if it was sourced from a VHS tape. 2.5/5. I think this film needs a remaster. For a film that's shot on 35mm and is not even ten years old yet should not look this rough. I think it has some great performances despite the jumbled plot. I got this for free and I can recommend it since you can get it for $5. I wouldn't pay more for it than that. 3.5/5.